If you were to insert the word “Later” after the title of this film then I would not hold it against you, as the similarities to Danny Boyles 28 Days Later are glaringly obvious right from the start. I am not saying that this is a bad thing at all. 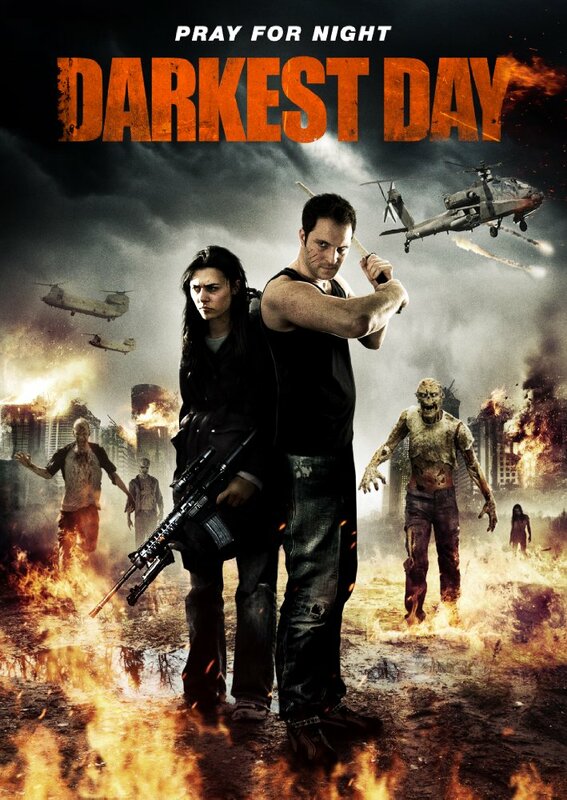 There are worse films to imitate and other attempts to do so have not done as good a job as Darkest Day has. I’m not sure if the creators of this film are quite as coy as to whether this is essentially a zombie movie or not. The word zombie is not mentioned in this at all (which again is no big deal as this happens a lot nowadays), but some of the more recent viral/rage infected type films seem to want to avoid the zombie label completely, maybe try to be more contemporary than your average zombie flick. However, before I disappear down the motorway to Rantsville on this subject, lets stop off at the nearest services, buy an over priced Double Choca-Mocha-Salted Caramel-Fudge Latte, and discuss the merits and downfalls of this particular film like I’m supposed to….. This is the directorial debut of visual and special FX artist Dan Rickard, who co-wrote this with friend Will Martin and plays the lead character. As well as this film he is also responsible for the visual FX on films such as 2010’s African zombie movie The Dead (where he also played a small acting role) and 2015’s Hollywood hit The Martian. He started with the idea of Darkest Day when he was at University in 2006 but originally filmed it as a 30 minute short film only to return to it a couple of years later to develop it into a feature film. Quite a few years later with a miniscule budget, no script (deciding he wanted it all improvised) and roping in friends to fill in acting, sound and production roles, sometimes all at once, Darkest Day was completed. It begins with lead character Dan (Dan Rickard) washed up on a beach in Brighton with no memory of what has befallen the human race; he then wonders the streets searching for signs of life. He happens upon a couple gathering supplies but then they are all attacked by The Infected (fast, flailing, viral, rage infected beings who are feeding on human flesh) but they make a break for it. He gets taken into a house of survivors who are not only hiding from The Infected but also from the soldiers who are now gunning down civilians whether they are infected or not. Dan himself is also being hunted by the soldiers for reasons not quite clear to him yet. As mentioned the similarities to 28 Days Later are so incredibly close with the plot line. Both are set in a UK city during a viral outbreak with survivors, of course featuring a potential love interest for the main character and a tough guy who eventually turns out to be good and helps the main character, all of them being pursued by both Infected and Army, battling to stay alive. It is the basis for many a tale of the viral zombie outbreak and been told many times but it is a story I have a lot of fondness for especially when it’s told as well as this! Some of the acting is pretty dodgy and Dan Rickard openly admits that he is no actor which does come across on a few occasions but Samantha Bolter who plays the main female character, Kate, is superb and Chris Wandell as tough guy Sam is okay but a little over the top at times. The others are acceptable but do come across as quite one dimensional. The soundtrack is great and really effective, done by Richard Wilkinson (or Wilx) who also plays the role of James in the film. Now onto the zombies, or Infected, or zombies whatever you want to call them. It starts off with not a lot of them but then builds up to quite terrifying moments of swarming hordes of screaming, flailing, blood soaked zombie gloriousness! As they are the fast viral types there is not a lot of detail to their make up just a lot of fake blood and masses of shaky camera syndrome which just enforces the similarities to a certain film already mentioned and reminiscent of the wonderful zombie movies of the 80’s. Known for his skills in visual and special FX Rickard did them all himself. He only used CGI where needed, for example to make the streets look post apocalyptic by adding trashed cars and fires. They only had 3 soldier costumes so he used it to duplicate the numbers and to create the Chinook helicopter flight scenes with the use of models and blue screen. Basically all the FX are used for the right reasons and do not look tacky in the slightest for the budget used. On the whole an enjoyable British zombie film done well, worth it for the hordes alone despite its very similar storyline.